BRIDGEWATER – Harold “Satch” Wandless Armstrong, 94, formerly of Churchville, passed away Thursday (March 21, 2019) at Bridgewater Retirement Community. Born September 10, 1924 in Lone Fountain, he was a son of the late Roy Wandless Armstrong and Margie Pauline (Siron) Armstrong. A graduate of Churchville High School, Harold served in the U. S. Army Air Forces during World War II. He then earned a bachelor’s degree from Bridgewater College and a master’s degree in education from the University of Virginia. Harold was a teacher, coach, and guidance counselor at Weyers Cave High School, North River High School, and Buffalo Gap High School. He loved farming and was the owner of the hardware store in Churchville. He was a board member and past president of the Augusta County Farm Bureau and a charter member of the Churchville Ruritan Club and the Izaak Walton League. His love for people motivated his involvement in numerous other organizations. He loved all sports and enjoyed playing football, basketball and baseball. 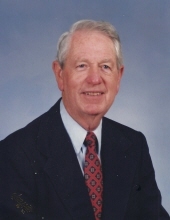 As a lifetime member of Loch Willow Presbyterian Church, he served as an elder and in various other roles. He was preceded in death by his parents and a brother, Joseph Roscoe Armstrong. Surviving are his wife of 67 years, Kathleen “Kitty” Funkhouser Armstrong; two daughters, Susan Thacker and husband Tom of Weyers Cave and Gracie Armstrong Haines and husband Christopher Covert of Charlottesville; a son, Fred Armstrong of Goodview; seven grandchildren, Kate Anderson, Andrew Thacker, Rebekah Armstrong, Bethany Gail, Skylar Haines, Adam Haines, and Ivy Haines; four great-grandchildren, Natalie Anderson, Jack Anderson, Ku’uipo Robbins, and Aurélia Robbins; and numerous nieces, nephews, and other family members. A private burial service will be held in Green Hill Cemetery. A memorial service will be held 11 a.m. Saturday, March 30 in Loch Willow Presbyterian Church, 37 Buffalo Gap Hwy., Churchville, officiated by Pastor Reed Hopkins. The family will receive friends from 5 to 7 p.m. Friday, March 29, 2019 in Bear Funeral Home. Memorials may be directed to Loch Willow Presbyterian Church, P. O. Box 85, Churchville, VA 24421; the Salvation Army, P. O. Box 2412, Staunton, VA 24401; or a charity of your choice. Bear Funeral Home is serving the family. Condolences may be expressed to the family at www.bearfuneralhome.com. "Email Address" would like to share the life celebration of Harold W. Armstrong. Click on the "link" to go to share a favorite memory or leave a condolence message for the family.